There are few contrasts as stark as Egypt’s Sinai peninsular. Scorched brown mountains devoid of life, provide a backdrop to achingly blue water teeming with life. Nuno Gomes is also a man of contrasts. He has a wide beguiling smile that appears spontaneously whenever he speaks. Interviewers have a grim time. He is relaxed to the point of being evasive. For those that know this world champion, who recently set a new scuba world record, the words most often used to describe him are humble and relaxed. However, under this calm exterior is a man of iron will, stubborn almost. On the morning of the 10 June 2005 Nuno and I were jolting along a sandy road in a jeep. We were heading toward a make shift pier, at the southern end of a town called Dahab. At the pier we would find the NABQ Explorer dive boat berthed, loaded with 106 tanks, and enough dive equipment to worthy the envy of any small scuba school. Nuno was laying snoozing. Eyes shut. The morning was cool. The sun has not yet risen. To the east, the distant shore of Saudi Arabia was smudge of pink. I presumed Nuno was visualizing the mammoth dive ahead of him. He could have been sleeping. You never know with Nuno. The NABQ Explorer slapped a drum beat as we motored out of Dahab and into the Gulf of Aquaba. We were headed 4 Km out to sea toward an insignificant spot, North 28`27.263` / East 034`29.652`. We simply called it Nuno 1. Days before we had patrolled back and forth pinging sonar scans at the ocean floor searching for a deep drop off. It was frustrating work. The sonar was not reading accurately. Three times the shot line went over with 340 metres of rope attached. Twice the weights found sand and it hung limp in the water. It is 06:30 am and already uncomfortable swells are rocking 12 litre cylinders from their restrainers. The wind is pumping steadily down from Jordan and the wind surfers blend into a streak of colourful tick marks. The wind had caused us to cancel the dive on the 09 June, we could not afford to postpone again. I turn my attention to the frenetic activity in the boat. The white deck is dotted with black neoprene and half dressed divers who buzz with anticipation. I make my way to the stern. Bogged down by weights and a cumbersome dry suite Nuno shrugs into four 18 l steel cylinders. The quads are pumped with trimix to 240 Bar. Three are manifolded and the fourth is a bail out. A puzzle of hoses are swung out over his shoulder. Each has been checked and rechecked. Stages dangle left and right, carrying travel gas and extra trimix. Nuno cannot bend and so support divers fit the fins. The weight is oppressive and the heat in the dry suite causes his brow to glisten. The skipper throttles back as Nuno 1 comes up on the GPS monitor. Camera crew crash into the water first, with snorkel support quickly to follow. For a moment the sea is calm. Half shuffling, half pushed Nuno grunts toward the water and flops forward. The cacophony of the boat is replaced by a serene blue world where gravity no longer punishes. The plumb straight yellow shot line is ahead, vivid as lemon rind. Far far far below four tags are clipped onto this line: 315 m, 321m, 325 m and 330 m. For a few moments Nuno breathes deeply from his air stage and stares below him. And then he is gone. One diver on a solo mission to be the deepest man on earth. Nuno free falls down the shot line. Attached to the shot line are eight staged cylinders. The deepest is located at 180 metres (trimix) and the shallowest at 55 metres (air). Briefly he pauses to jettison the travel gas (air) at 50 metres. Air is toxic at the depths Nuno is destined for. Out of sight at 325 metres an HID torch shines like a beacon. It has a burn time of 25 hours and pierces the velvet darkness. It is a comforting site. Later Nuno recounts the moment he spotted the warm glow of light below him. “I was going and going and going and then I saw the torch. It gave me a target to aim for, otherwise I don’t know …” He trails off and you wonder what demons he had to face. HPNS, a syndrome similar to Parkinson’s disease, was one demon. “From 180 metres you feel helium tremors. These get progressively worse. At 280 metres my body was convulsing”. He recalls, “it didn’t get any better or any worse so I carried on”. Such a simple statement underlines the tenacity of the man. Nuno reaches the nadir in 14 minutes. Shaking violently and in pitch blackness he detaches the 315 metre shot line tag. “I had to concentrate very hard. The rope was moving, I was convulsing and it was pitch black” he says “without the tag the dive was nothing”. To survive he must now travel and his ascent begins. There are 31 scheduled decompression stops ahead. Nuno is relying heavily on his support team. 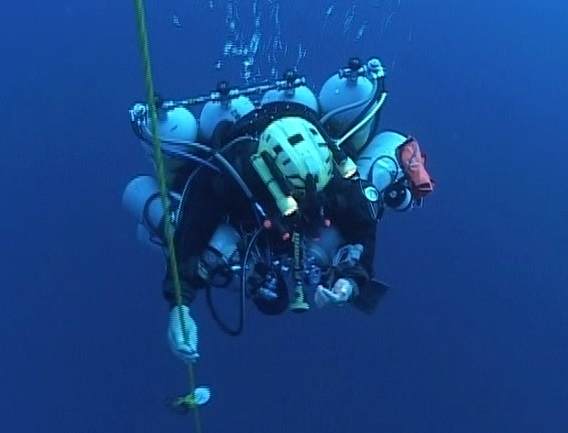 Experienced divers bring additional gas at predetermined stops. The gas cannot be staged on the line and it cannot be carried with him. There is simply too much. On this dive alone he will consume over 90 000 litres of gas. Each support diver has a role to play. Like a well choreographed ballet each diver moves on and off the line at precisely co-ordinated intervals. On this dive any late arrival could spell disaster. “On these dives if you think for a millisecond that you will fail, then you will die” he says, when I asked him if ever considered failure. “You must have a very strong reason to live otherwise you will not return”. A few days before the team were rehearsing a 152 metre dive above Nuno 1. The dive went smoothly, despite poor weather conditions, which boosted the confidence of the team. Acclimatisation dives, even at this level, are crucial. What no-one could answer was how a three hour rehearsal dive would compare to the dive on which we were now committed. It is 07:34 and Nuno should be ascending to 124 metres. If all has gone well Nuno will have beaten his previous attempt. In July 2004 he ran out of gas while attempting the world record. He chirps, “It was 271 metres and my main regulator was free flowing. It is not funny running out of gas at 271 metres”. An event as catastrophic as that would have killed most other divers. But not Nuno and not this time. The first trimix support diver defines itself as a dark silhouette. Nuno’s eyes are blank as a poker player but he holds up his left wrist. Clipped to the knife is the 315 m tag. It is a world record. Later, impartial observers back at Planet Divers would confirm a final depth of 318.25 metres (excluding any rope stretch). “It was good to see another human again”, Nuno laughs, “I could see a glint in his eyes and we shook hands”. With the support diver come extra gas, messages of love, congratulation and a comfort zone. “It was such a relief to see Nuno”, Venter says when I asked him about the emotional pressure associated with being the first support diver, “No-one really knows if the deep diver will be there, or if the extreme dive will work out. The rule books have not yet been written”. While Venter escorts Nuno back to 80 metres he has time to release a red SMB. Attached are two tags: “World record” and “OK”. It is a simple message that is about to change the dive world. The SMB is partially filled with air and released. A helmet mounted video camera records the buoy as it corks like a firework to the surface. It is 0743. The SMB erupts close to the main buoys. The patrolling Zodiac kicks up sea spray as it pulls a wide circle to intercept it. All eyes on the mother boat are scrutinizing the silhouettes on the zodiac. We are searching for a sign. The tension is near breaking point. Success or disaster is contained on those two small tags. An “Alert” tag even accompanied by “World Record” would open up a catalogue of disasters, disguised in an infinite number of combinations. The Zodiac gives a victory sign and the NABQ Explorer opens up her air horns. The din of the engines is momentarily lost as relief spills over into celebration. Nuno is alive, he is ascending and he is a record breaker. The surface support quickly begins to contact the outside world. Overcome with relief and joy most support crew have a lump in their throat, Foster-Jones recounts “We were all a mixture of emotions. I couldn’t see the letters on the cell phone through tears of relief”. The National Geographic team are prowling for a statement but the team shrink back to resume their vigil. They know that the battle is far from over and there is no room for complacency. 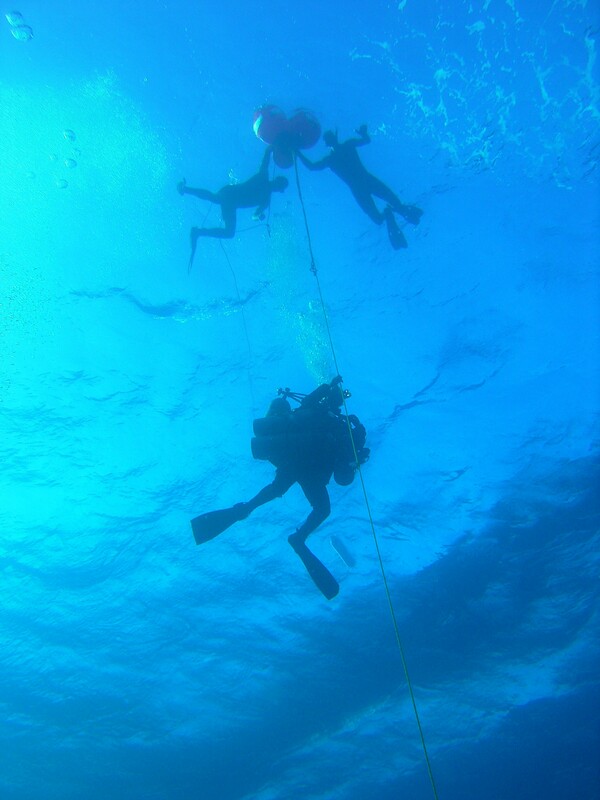 Below, at 80 metres trimix support bid farewell to Nuno. He is on his own again. Later, while sipping strong Turkish coffee I asked Nuno if he was affected by being alone in the water, “Not really. It is business as usual. I have a job to do”. From 80 m Nuno has a further sixteen decompression stops ahead of him, before the dive world will acknowledge his accomplishment. He inches up the line consuming gas from stages secured on the line. Higher he climbs, as empty stages are shovelled upwards on the line. Check the run time, check the gauges, check the dive computer. Move up. Too buoyant. Release pressure in the BC, release pressure in the dry suite and check the dive plan. Keep contact with the line. Move the depleted cylinders higher. Check the run time. On schedule. He is working hard. Deep air support diver Gareth Lowndes, materializes from the blue after 86 minutes run time. In quick saccadic movements I run an experienced eye over the gauges, stages and hoses. It takes a millisecond to establish that the stages are secure, configured correctly and have predictable pressures. The correct gas is being used at the correct depth and there is plenty of spare. I settle into a 20 minutes shift at 60 metres and accept responsibility for the seven empty cylinders that bob around us. A breath from the wrong tank or gas mixture at this depth would derail the decompression profile. They bounce and clang and jostle for space. I look into Nuno’s mask and our eyes connect. I instantly comprehend Nuno’s determination and resolve. I am also confronted by the other human emotions of fear and of relief at having been close to the ultimate destination and survived. The twenty minutes passes swiftly. My computer is dictating decompression drills in the region of 160 minutes. My instincts are to ascend but we have agreed that at no time after 60 m is Nuno to be left alone. At these depths it takes just an instant for calamity to strike. Stage tanks are secured to the shot line using metal karabiners identical to those used in climbing circles. I get busy and try to loosen a karabiner carrying empty stages so they can be moved to the surface. The screw is locked tight and almost impossible to release. Earlier, Nuno had a similar experience. A karabiner holding a cylinder was seized. Nuno said, “I had to leave the 180 m mix. I got to the spare trimix bottle at 140 m and it was also stuck. I knew the 120 m stage was too far away. I had to use all my strength to release it. Eventually the karabiner moved”. Such an insignificant detail, with such massive consequences. The experience will be logged and added to the vast amount of knowledge required to pull off some of the world deepest dives successfully. As one of the worlds pioneering deep divers Nuno has an enviable track record of safety and attention to detail. He is the only man to have exceeded 250 metres more than four times. Throughout the next 10 hours Nuno edges ever closer to his goal, the mirrored surface of the ocean above. Slowly he is weaned off the deep gases and through a series of carefully calculated mixes. Time ticks by as air bottles replace helium bottles, and nitrox replaces air. His body tissue is undergoing desaturation. It is a slow process. Eventually pure oxygen will accompany him the final few metres to the surface. Despite the 24 degree water Nuno is cold. “I was cold from 200 m down and all the way back to 30 m, despite my dry suite. The helium causes a body heat deficit. I pumped my inners with air at 60m but I took a while to recover”. At 30 m support divers send urgent messages to the surface. Nuno is developing a problem with his right ear. In 1994, Nuno suffered an ear bend while ascending from a 253m Africa record dive at Boesmans Gat in the Northern Cape. Back in Egypt the support team hope this development is not a reoccurrence of the same injury or worse, counter diffusion. Counter diffusion is a phenomenon created when helium is trying to escape out of the body while nitrogen is rushing in. Over a bottle of Port in Johannesburg a few weeks later I asked Nuno about the ears, “It took me about 12 hours to regain my full hearing after the dive. It was not counter diffusion it was trauma to the ear membrane”. More fluids are taken down to reduce any compounding dehydration. And we wait and watch the orange buoys bob up and down. And we wait. The Gulf of Aquaba has a slight southerly current. In mid water both shot line and decompressing divers are immune to the current as they both drift at the same speed. Not so for vertical movement. Stage bottles clang together as the swells toll on the shot line. Along with support divers, small black and white striped Damsel fish, ocean nomads, migrate to the line. They are curious at the rude intrusion and adopt the thin vertical yellow reef as a mid ocean refuge. Further out, the vastness of the ocean is punctuated by translucent thumb sized jellyfish. They pulse in a regular beat, drifting aimlessly. Nuno moves higher. He is at 9 metres. It has taken him a staggering 404 minutes to reach this point of the dive. Ahead of him a further 336 minutes. He glances up. The opaque glassy surface represents the finish line in this race. The hull of the NABQ seems close enough to touch and yet this is an impossibility. The invisible decompression ceiling at 9 m is 100 minutes. To violate this invisible barrier, even for an instant, would mean death. The laws of physics are inviolate, unsympathetic and merciless, even to an exhausted diver. A low resonance slowly defines itself as a sea scooter trailing a white circus trapeze. It is a sight that captures our attention. Three identical plastic bars are supported by two large inflatable buoys at the surface. The bars are at 9 m, 6 m and 3 metres and weighted by 30 Kg of lead. The trapeze represents the final 6 hours of decompression, much of it using oxygen. For Nuno it is a chance to rest. He leans his weight onto the bar and uses it for support. 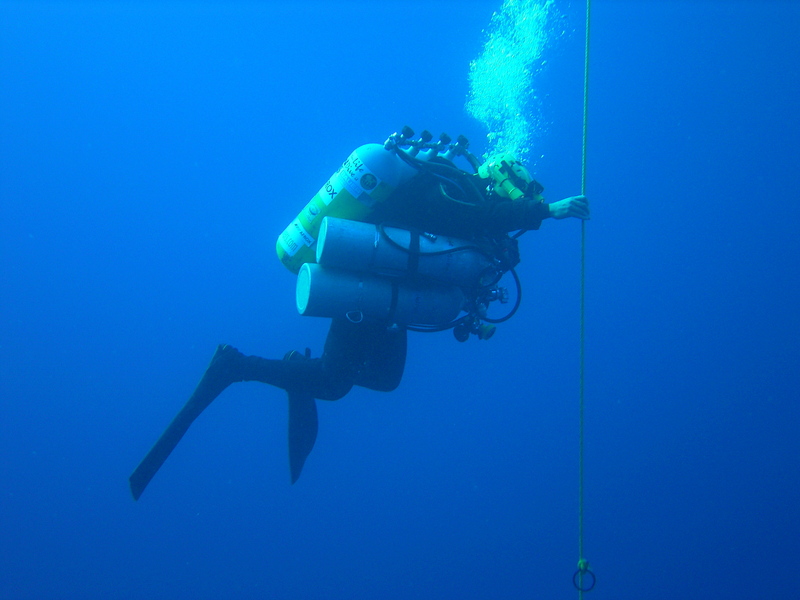 More fluid arrives and oxygen cylinders are attached left and right by support divers who flank an impassive Nuno. The vigil continues. Oxygen is essential to speed up decompression, however, Nuno must ensure he does not go into convulsions precipitated by the high oxygen partial pressures. Air breaks are essential. Nuno hands the Staminade around. All members of the team are beginning to feel the strain of the dive and attention waivers. The relentless swell forces an oxygen cylinder loose, it plummets spiralling to the ocean floor to be lost forever – a 1000 metres below. Messages are relayed to the surface on slates. The patrolling Zodiac intercepts the messages and within 5 minutes a fresh oxygen bottle is staged on the bar. The weather is steadily deteriorating and the trapeze is bucking to the rhythm of the swell. Nuno has climbed to 6 metres but his arms are tiring with the continual jolting. The sea scooter is attached to the 9 metre bar and the trapeze moves slowly through the water. The reprieve from the pounding swell is startling. The horizontal movement cuts through the swell and like a bizarre high wire act the trio of technical divers move through the water. The reprieve is short lived. The scooter stutters and the trapeze slows and then stops dead. An autopsy aboard the NABQ reveals an electric fire has created a short. Dejected, the snorkel support climb into the water to offer Nuno psychological support. The swells are intimidating. Nuno is hanging on at 3 metres. “Every action takes concentration, I felt like one of those Comrade marathon runners that crawl the final 100m. My arms were really tired from hanging on to the bars”. After 12 hours in the water it is difficult to assess how a person must feel. External motivation is cursory compared to the personal discipline required to complete the task. Unlike the comrades marathon quitting is not an option. You cannot simply quit and go home. The endless rotation of support divers continues although Nuno is aware only of breathing and time. It is Nuno versus Nuno. The battle has become physiological as well as physical. After twelve hours and twenty minutes at 18:15pm (GMT) Nuno Gomes breaks through the liquid winning line. Support crew crowd the rails and in an instant the twelve hour ordeal shrivels to a moment. Snorkel divers leap into the water. Like a lifeless doll Nuno is extracted from his harness. His computers catch on the webbing and a wave engulfs us all. Closer we edge to the stern of the NABQ explorer. With a wriggle he is free. Just in time. Another wave lifts us high and arms stretch down and mercifully pluck him from the water. Gravity returns abruptly as he is thrust onto the deck. He recalls “I was thrown down like a rag doll and it hurt”. Surprisingly his face is sun burnt. Photo lenses bristle while dive crew try to give him space, anxiously awaiting his first words. There is a crowd. Quietly he sits. No words. The previous twelve hours are deeply etched on his face and you can read the battle that had taken place in his posture. Finally, a smile. A large smile with those characteristic bright teeth. It is the smile born of a victory and it is enough for us all. No words required. The motors explode into life turning the sea white with foam. The bow points toward the rickety pier that we had left earlier this morning. In the gathering darkness a throng of people four deep were clustered on the small jetty anticipating our arrival. Across the lagoon voices raised in welcome. Accents and languages fused together, Canadian, Arabic, Polish, English, Australian, Russian , Czech, American. Cooks, cleaners, filmmakers, photographers, hotel staff, radio, TV, and local dignitaries crowded the structure. The NABQ Explorer slid gracefully into her berth as the western horizon showed the faintest blush of pink. I glanced over at Nuno. He had his eyes shut and seemed unmoved by the commotion he had created. He could have been sleeping. You never know with Nuno. Dr Gareth J Lowndes is Chairman of Wits Underwater Club and an active CMAS instructor. When not underwater he is usually found at Wits Medical School, where he runs various undergraduate and postgraduate clinical programmes.